HomePod, Apple’s answer to Sonos, Echo, and Google Home is coming out next month. Apple has largely been positioning HomePod as a high-end speaker + assistant, as opposed to an always-on assistant + speaker(Echo and the like). HomePod is designed first and foremost to be a really great speaker, which is something different from other smart-speaker offerings. Having heard it side by side with The Sonos Play One and Google Home Max, A single HomePod is already much better than both in terms of sound quality. I would say the Sonos Play One was 80% of the way there, but it just lacked the clarity of bass and wide soundstage. I had a hunch that HomePods in Stereo would give my KEF X300A’s a run for their money… now it’s confirmed. Apple briefly demoed stereo for me, and I was quite floored. When Stereo is enabled via software update, a pair of HomePods may be the best bookshelf (2.0) setup under $1000 that you can get. Ahead of HomePod’s release, I really haven’t had much interest in it - I’m more interested in the smart assistant functionality than audio quality, but this review has piqued my interest. While I typically wouldn’t gravitate towards high-end audio, it sounds like what Apple has done by processing the audio before it’s played has really made HomePod magical. I haven’t ordered one, but I’m keen to try it out at an Apple Store following release. I really like the sound and feel of this board. 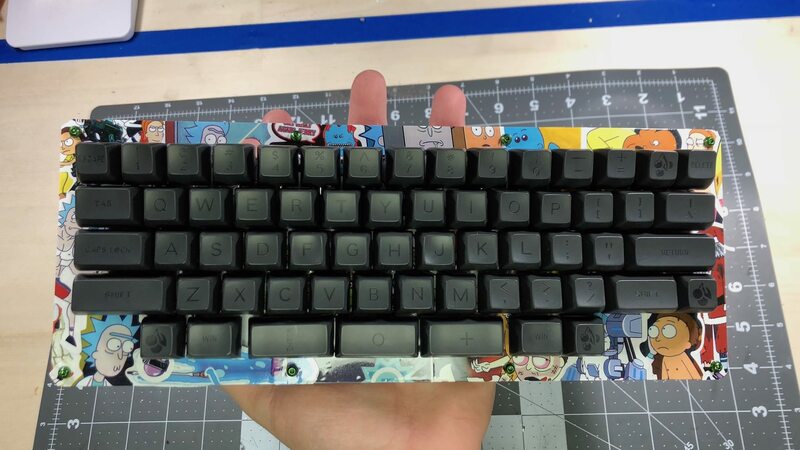 The 78g Zealio switches in this board are quite tactile, and in conjunction with the Maxkey SA keycaps they feel great. The sound of this board is mostly muted, with distinct clack; it’s likely one my quietest keyboards. Getting ready to design the plates, I settled on what I wanted out of the case. My big priorities were for a HHKB layout, with wide bezels, and support for split-spacebars. I knew going into the design that I would be putting stickers all over the plates, so I wanted as much space as possible to highlight the stickers. 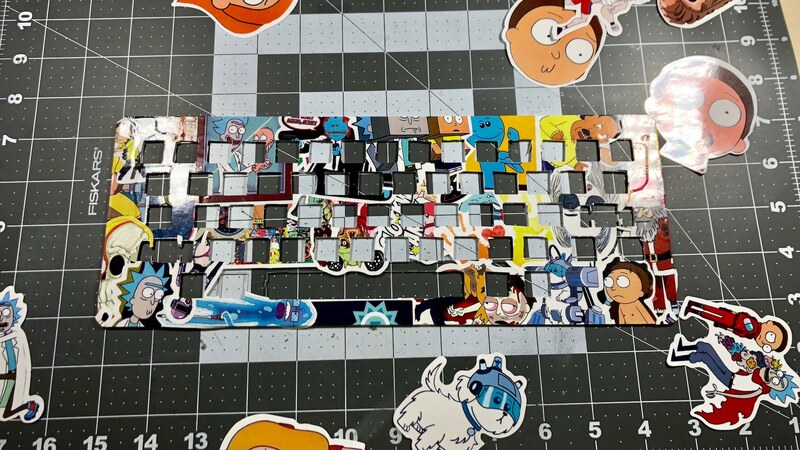 The wide bezel all the way around allows more stickers to be seen, and the blocked off keys on the bottom row would give me even more room to feature stickers. I also chose the HHKB layout because it’s simply my favorite arrangement for 60% keyboards. I’ve already got a board with this layout, and love using it. 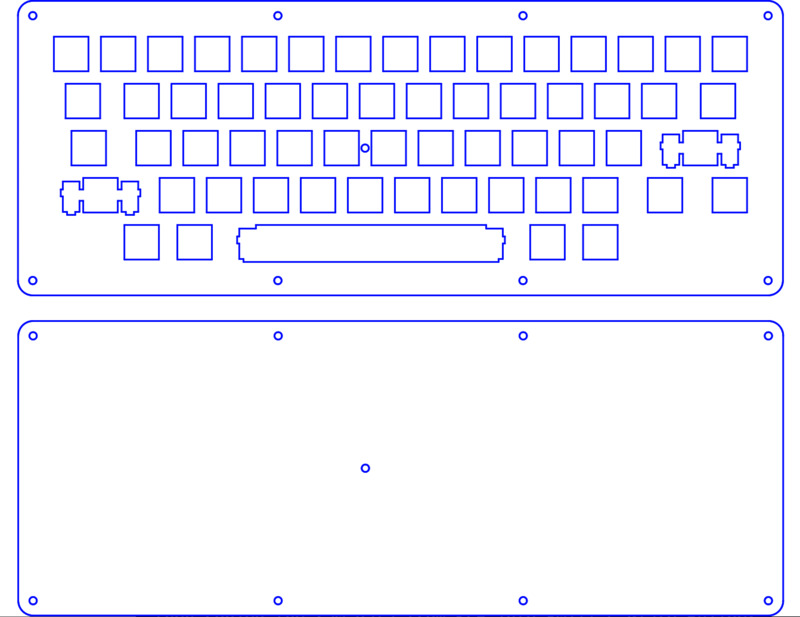 To design the board, I first mocked up a design on Keyboard Layout Editor, then copied the raw data from KLE into Swill’s Plate Builder tool. If you haven’t used Swill’s tool before, it’s amazing. Without this tool I likely would never have had the ambition to do this build. Swill’s tool imports the raw layout data from KLE, and provides a SVG or DWF output with a plate design. 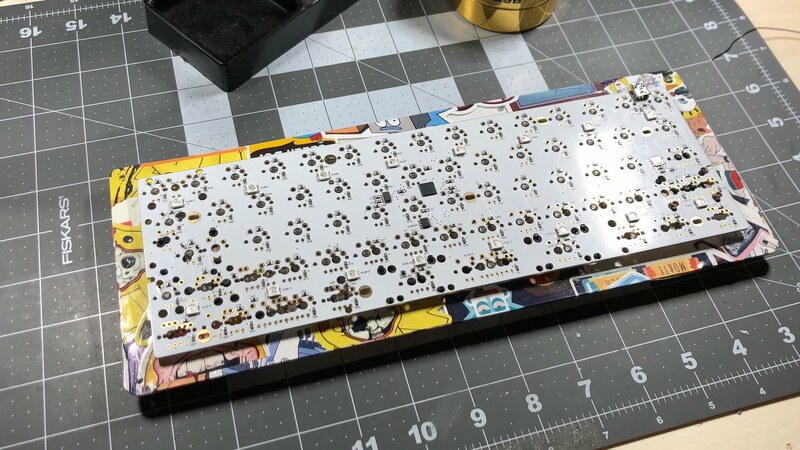 There are tons of levers and switches on the site - you’re able to adjust the plate design for use in standard 60% cases or sandwich & skeleton style cases (like this build), adjust the screw hole size, bezel, corner radius, and more! The output from Swill’s tool gave me a good basis for the plate design. From there I made further adjustments to the design using QCad. Specifically I made adjustments to the stabilizer openings, and switch openings for the split spacebar. Designs for the case are available here. For manufacture, I opted to use Ponoko. There are also a bunch of other companies that can do custom-cut plates. For acrylics, Sculpteo, for metals, BigBlueSaw. The plates I ordered from Ponoko were 1.5mm clear acrylic. In hindsight, I likely should have ordered thicker plates. By themselves the 1.5mm plates were quite flimsy - this had been a hand wired build they would’ve been completely unsuitable. Fortunately, once fully assembled the board was quite sturdy, but if I could do it over again, I likely would’ve ordered 3mm acrylic, or opted for steel plates. Aside from the case, all other parts for this build use off-the shelf parts. While this is not my first 60% layout board, this was my first time using the DZ60 PCB from KBDFans. I’ve been really impressed with this circuit board. It’s available at a very competitive price, just $40. 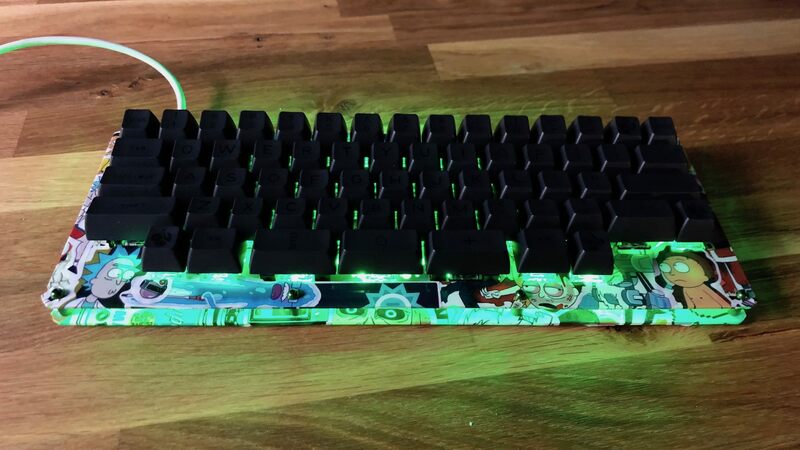 It has integrated RGB underglow, runs on QMK, supports LED backlighting, works with all standard POKER style 60% keyboard cases, and is compatible with more layouts than any other circuit board I’m aware of. The killer for this PCB is its bottom row - with support for 6u, 6.25u, 7u, and split spacebars. I plan on using the DZ60 for the next few 60% builds I have planned. As I refined more ideas about how to execute this build, I decided that I wanted a ‘theme’ for the stickers. 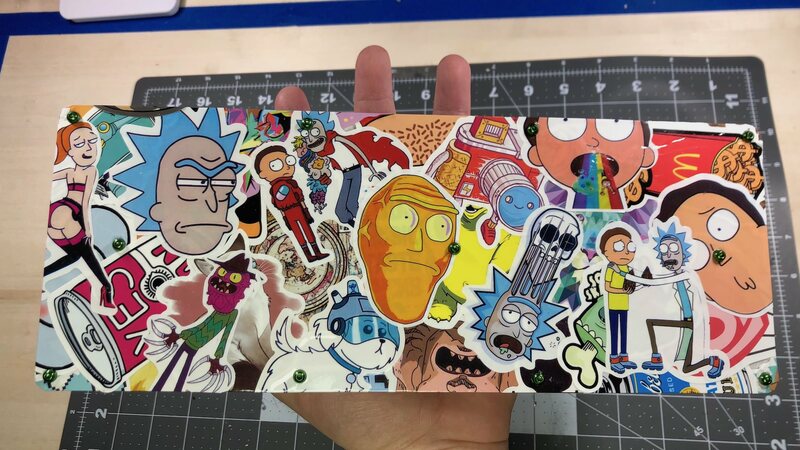 I already had a couple sticker packs, and was gifted a Rick and Morty stickerpack by my girlfriend. 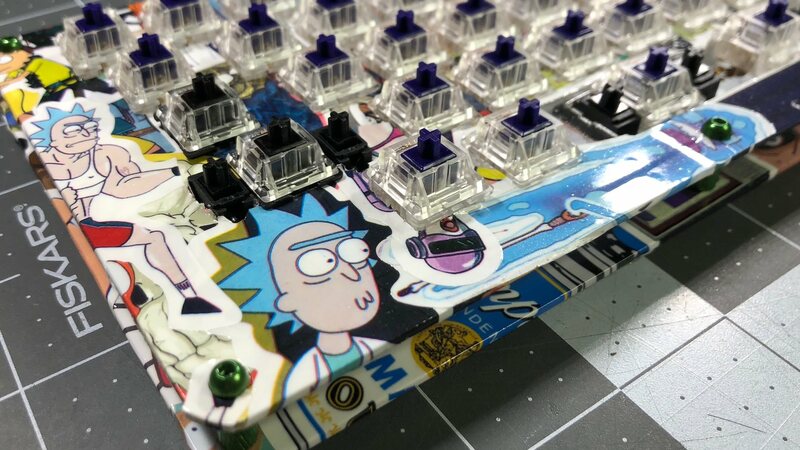 As a big fan of the show, I opted to use a Rick and Morty theme for this build. 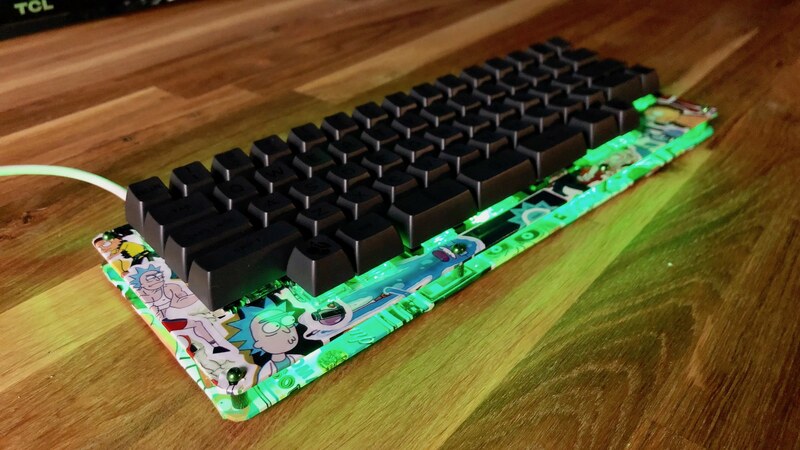 The majority of the visible stickers are from the Rick and Morty pack, and I set the RGB underglow on the PCB to green - a la the green of Rick’s portal gun. This build was one of my longer ones. A lot of keyboards I can build in just a couple hours; assembly for this build took over 6. I started by prepping the plates. First, the protective cover over the acrylic was removed. Then I started applying stickers over both plate until they were fully covered. Then came the process of cutting out switch holes in the top plate. This initial prep took well over two and a half hours. After I was satisfied with stickers on the plate, I applied a Rustoleom clear enamel on both top and bottom plates, so that the stickers would stay down on the acrylic, and be protected from bumps and scratches. While the enamel dried I prepped my stabilizers. As I’ve done before, I clipped the stabilizer legs and used Finish Line Extreme Flouro lube. New (to me) for this build was the band aid mod. 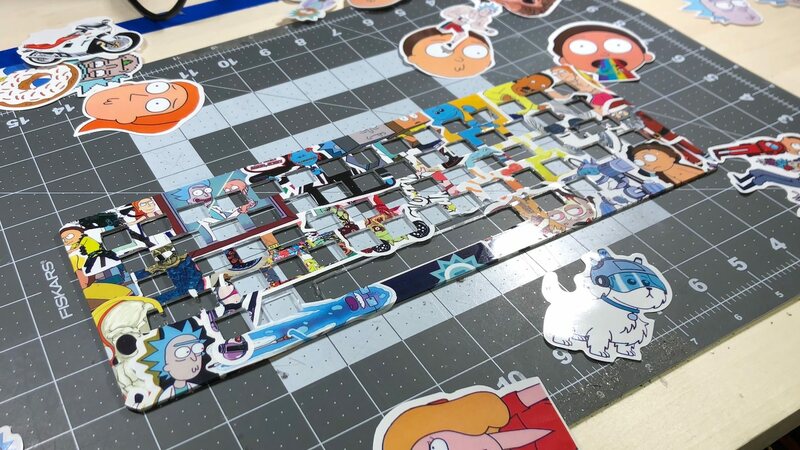 With this mod, sections of cloth band aids are cut up and applied on the PCB, below the stabilizers. This mod reduces stabilizer rattle significantly, and provides a very slight cushion when stabilized keys are fully depressed. With all these mods and work, I can say conclusively that this board has the best feeling stabilizers I’ve ever used. Once the enamel dried, it was time to install switches. Here the thin plates hurt me. With how flexible the top plate is, it took a lot of effort to get the switches fully seated in the plate and on the PCB. If I’d chosen a thicker acrylic or stronger material, this would have been a much simpler process. 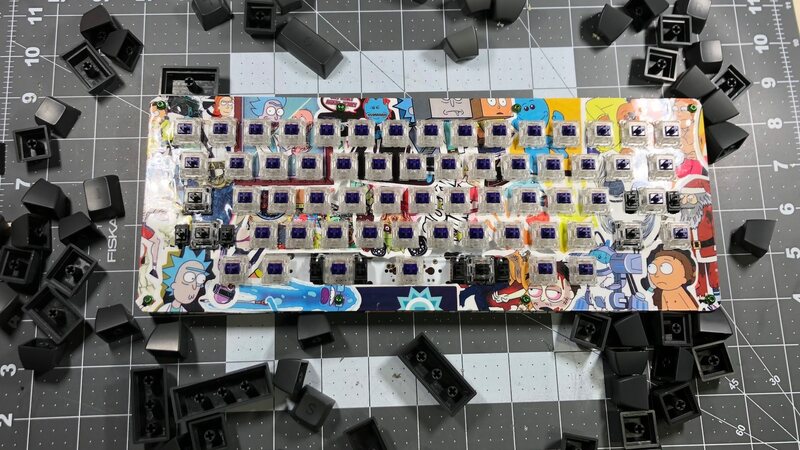 The primary switches for this build are 78g Zealio switches. 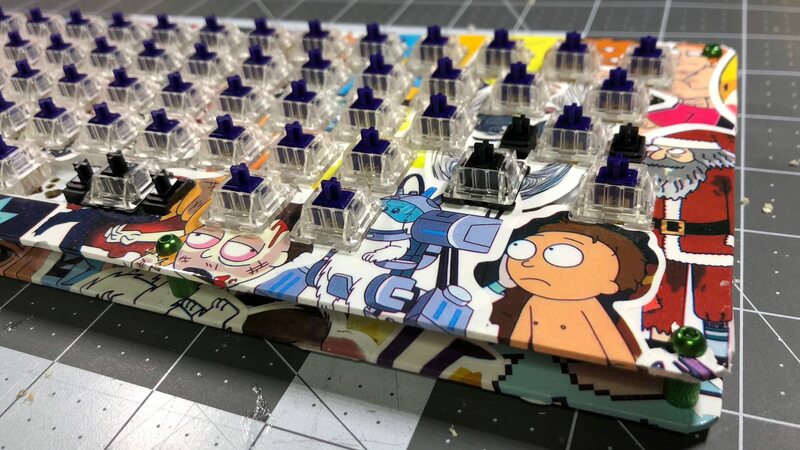 I’ve done boards with Zealios before, but never this heavy. As I’ve gotten deeper and deeper into this hobby, I’ve gained a big appreciation for heavy switches. These Zealios feel excellent. They’re smooth, tactile, and heavy, but not too heavy. I also installed Gateron blacks for the shift keys and spacebar. I like my shift and spacebars to be lighter than my alphas, and linear. These Gateron blacks are great, a big upgrade over the Cherry blacks I’ve used previously. The Gaterons have a similar weight as the Cherrys, but are significantly smoother. With switches installed, I broke out my handy circuit board holder and began soldering. Now that soldering was complete, I assembled the board, installed keycaps, and got to programming. The full keymap file for this board is available here. This board took a lot of time and effort to put together. I had been toying with, working on, and acquiring parts for this build for over a year. Given all the true custom work needed to build this board, I have a lot of pride in this build. There were a few missteps along the way (mostly with my plate material choice), but despite those missteps this board turned out better than I could have imagined. 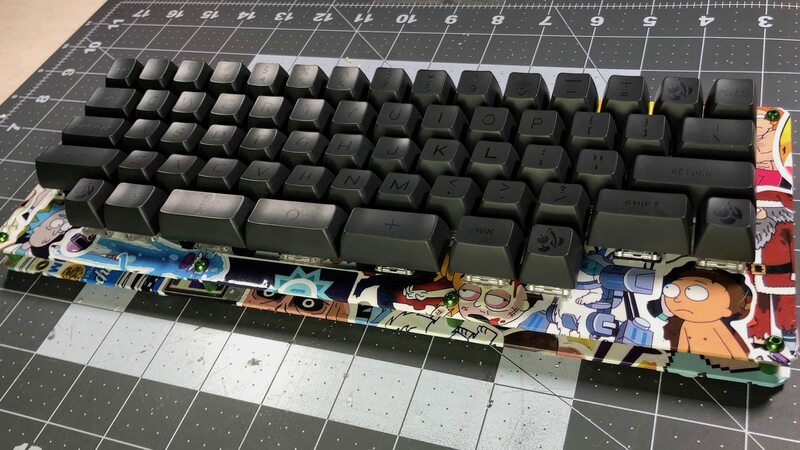 This stickerbombed DZ60 feels great to type on, and is visually very striking. It’s far from a ‘clean’ looking build, but it wasn’t meant to be. This board was meant to be loud, and gaudy, and over the top - and it is.